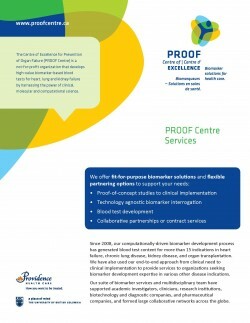 The PROOF Centre’s service arm provides expertise in end-to-end biomarker workflow to organizations seeking to discover, develop and implement blood-based molecular biomarkers in a clinical setting. We can provide multiple potential points of collaboration with a focus on critical clinical needs and opportunities through strategic engagement of industry, academia, government, and clinician stakeholders. We have an agnostic approach to technology platforms, allowing multiple and best in class choices. We provide single-point access to cohorts, technology platforms and renowned experts in all facets of heart, lung and kidney failure. Click here to learn more about our Computational Services.